hi, my name is jess and i am a chocoholic. (hi, jess) i’ll take chocolate pretty much anyway that i can get it. i made up a batch of these cupcakes for a superbowl party this weekend. with all of the junkfood available for consumption, these would just be another log on the fire. 🙂 i’d highly recommend making a batch of them for your valentine. the cupcakes are from martha stewart’s recipe for one bowl chocolate cupcakes and it is true, they really are. the frosting recipe is a swiss meringue buttercream (swbc), my second attempt at this type of frosting. if you’ll recall, the first one that i used had too much butter. i found a very helpful tutorial on howtoeatacupcake.net. i am much happier with the results, but i still want to make a few more tweaks. 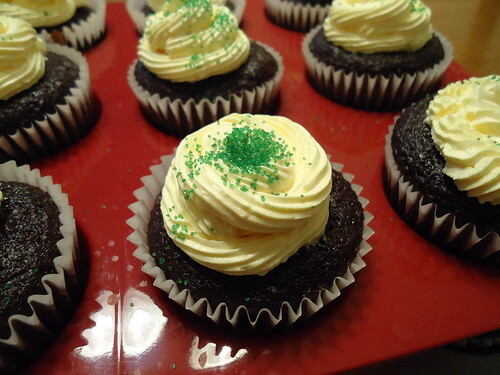 overall, the frosting is great for piping, as long as it is cold. pre-heat oven to 350°. line standard cupcake pans with paper liners, set aside. 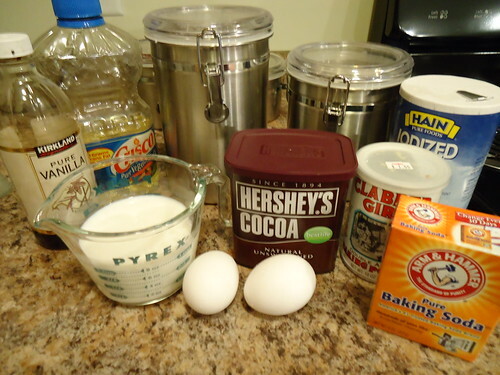 addcocoa powder, flour, sugar, baking soda, baking powder and salt to a large mixing bowl, stir to combine. add eggs, warm water, buttermilk, oil and vanilla and mix until smooth, about 3 min. scrape down the sides and bottom of bowl to assure batter is well mixed. divide batter evenly among cupcake liners, filling each about 1/2 full. (warning! this is the soupiest cake batter i have ever made. prepare yourself to wipe drips from the cupcake pan.) bake until tops spring back when touched, about 20 min, rotating pans once if needed. transfer to a wire rack; let cool completely. swiss meringue buttercream, enough to frost 24 cupcakes. 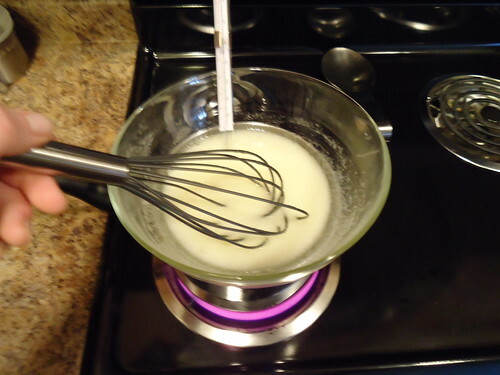 pour heated egg whites into the bowl of an electric mixer fitted with the whisk attachment. beat egg white mixture on high speed until it forms stiff (but not dry) peaks. continue beating until fluffy and cooled, about 7 min. switch to the paddle attachment. with mixer on medium-low, add butter 2 tbsp at a time, beating well after each addition. increase speed to medium-high; continue beating until frosting appears thick, about 3 min. reduce speed to low; add vanilla extract and continue beating 2 min. to eliminate air bubbles. refrigerate frosting for 30 min. and frost cupcakes, as desired.